Tag line: "Who will survive-in one of the greatest escape adventures ever!" 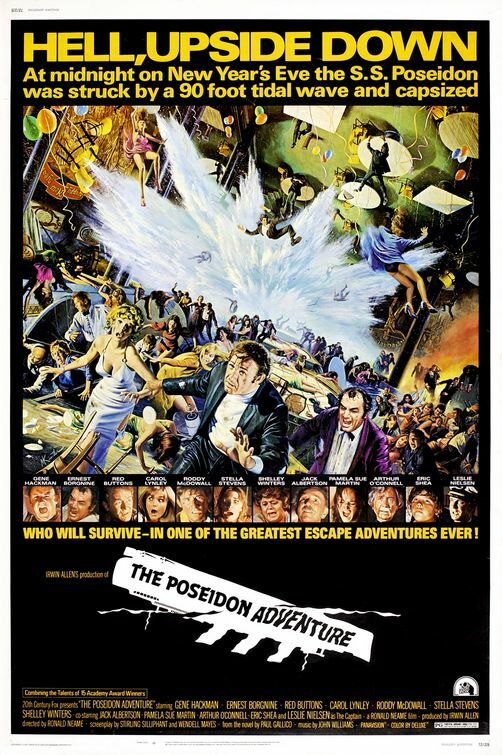 When it comes to the disaster films of the 1970s, the one I’m most familiar with is 1972’s The Poseidon Adventure. As a kid, I was fascinated by its story of an upside-down ocean liner, and never missed an opportunity to watch the movie when it played on TV. For an impressionable youngster, The Poseidon Adventure was high drama done to perfection. It’s New Year’s Eve, and everyone on board the S.S. Poseidon, a luxury liner on its final voyage, is having a great time. But the fun and frivolity comes to a sudden and tragic end when the Poseidon is hit by a massive tidal wave, one so powerful it flips the entire ship over. Among the survivors is Rev. Scott (Gene Hackman), a forward-thinking man of the cloth who believes God rewards those willing to fend for themselves. Realizing the Poseidon, which is now floating helplessly in the middle of the ocean, is quickly filling up with water, Rev. Scott convinces a handful of people to follow him as he makes his way to the bottom (now the top) of the ship to await rescue. Joining the good Reverend on his perilous journey are New York policeman Mike Rogo (Ernest Borgnine) and his wife Linda (Stella Stevens); Mr. and Mrs Rosen (Jack Albertson and Shelley Winters); lonely bachelor James Martin (Red Buttons); injured crewman Acres (Roddy McDowall); and a teenage girl named Susan (Pamela Sue Martin), who’s traveling alone with her younger brother, Robin (Eric Shea). Together, these few will brave the unknown, making their way through a maze of twisted metal and facing danger at every turn. Despite the fact some of them are a bit rough around the edges, The Poseidon Adventure does manage to make us care about its collection of characters. As played by Hackman, Rev. Scott is a determined, sometimes gruff individual whose one and only goal is to lead this tiny group to safety. As the newlyweds, Borgnine and Stevens are easily the least likable of the bunch; their constant bickering, with each other as well as the remaining survivors, is grating at times. The film’s most unforgettable performance is delivered by Shelley Winters, playing the rotund grandmother, Mrs. Rosen, who, when the chips are down, proves she’s got courage to spare. 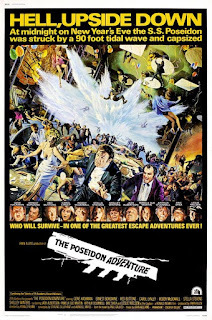 Yet as much as I wanted to see these people escape, what I always remembered most about The Poseidon Adventure was its more thrilling moments, key among them the scene where the ship is first hit by the wave and turned upside-down, a chaotic sequence featuring lots of well-staged destruction. The characters are, indeed, memorable, but it’s the sheer adventure of it all that stays with you the longest. I went with my mum & brother to see this film on one of ourfamily holidays(Sydney). I was very excited to see it as the hype about it was huge. It didn't disappoint at all even though I was young I thought it the best movie. Also I remember there was a behind the scenes special made as well that I thought was fantastic. I was 10 years old at the time & lived in the country. I still think its a great disaster movie, loved the song & the cast fabulous. A classic for its time.